The Arts & Crafts decorating style gained prominence in the United Kingdom in the late 19thand early 20th century, and it eventually spread across the Atlantic Ocean to the U.S. Founders of the Arts & Crafts design movement yearned for a return to traditional craftsmanship using simple forms that were free of excessive ornamentation. They also placed a heavy emphasis on using high-quality construction materials. The Art & Crafts bedroom furniture line available at AmishOutletStore.com pays homage to this traditional style that resonates with homeowners today. Whether your bedroom furniture calls for a bed, dresser with mirror, chest, nightstand, chifferobe or armoire, youll get an expertly-crafted piece that is simple in design but elegant in style. Talented Amish master crafters make each piece from the finest hardwoods, including Oak, Maple, Cherry and many other types. The Amish have fully embraced the Arts & Crafts style and have perfected its implementation over many generations. As you explore the many Arts & Crafts bedroom furniture pieces available at AmishOutletStore.com, you may want to consider how each could add to the overall visual delight and function of your home. Arts & Crafts bedroom collection pieces vary, from a 12-drawer dresser with mirror and a gentleman’s chest, to a bed and 1-drawer nightstand. This allows you to mix and match, selecting the appropriate items to add beauty and continuity to the décor in your house. Room layout – Is your bedroom a large or cozy rectangle? Or is it an unusual shape, such as an L-shape? 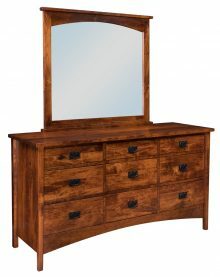 Each Arts & Crafts Amish bedroom furniture piece sold at our site is listed with clear dimensions. This helps you envision how it will fit with the layout of your room. We recommend measuring your space before placing your order to ensure every Arts & Crafts bedroom furniture item you buy is ideal. Desired style – Your bedroom may already have your desired style, such as vintage or traditional, or you may be transforming it to a new style with the help of your Arts & Crafts bedroom collection furniture pieces. Either way, you can be certain your Arts & Crafts bedroom furniture will complete your ultimate vision. 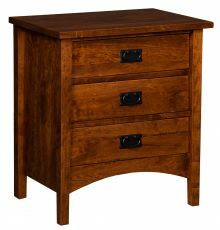 One of the biggest benefits of Arts & Crafts Amish bedroom furniture is that the lines are clean and strong, making it a perfect selection for nearly any bedroom. Other furnishings – You may have other furnishings, such as your grandmother’s favorite rocking chair, that you wish to include in your overall bedroom design. Remember to think about where you will put your current furnishings, in addition to where you will place your Arts & Crafts bedroom collection. You may even want to create a schematic on a piece of paper to help you visualize how your room will look after your Amish bedroom furniture arrives. Wood and stains – We offer several types of wood and wood stains for your Arts & Crafts bedroom collection items. This helps you create the ideal look by giving you the chance to have a dark, medium or light shade of wood or wood stain. Consider how each wood or stain color will enhance the color of your room, including the color of your floor. Natural beauty is always welcome in any home. Our Arts & Crafts bedroom furniture collection can help you build a bedroom that will feel like a well-appointed oasis year-round. 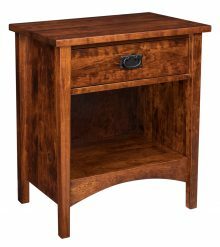 Order your preferred Amish furniture set pieces today through AmishOutletStore.com. Another key characteristic of the Arts & Crafts movement was that it eschewed the mass-production furniture making techniques that were gaining prominence in the late 19thcentury. Our Arts & Crafts furniture is made one piece at a time and completely by hand, just like it was more than a century ago. The combination of solid wood and superior craftsmanship results in a remarkably durable piece that will be a fixture in your bedroom for many years to come. You can plan on enjoying your Arts & Crafts bedroom furniture for a lifetime thanks to superior craftsmanship. The durability of Amish bedroom furniture is second-to-none, and it is the reason so many homeowners want all their furniture to be genuinely Amish-made. Trust our site for exceptional pricing and products you can pass down from generation to generation. AmishOutletStore.com is committed to giving our customers the best value for their bedroom furniture dollar. Save up to 33% off the regular retail price, and take advantage of our volume discounts that offer even greater savings. Great furniture at affordable prices is a combination thats hard to beat! Get a closer look at our complete selection of Amish-made Arts & Crafts bedroom furniture by reviewing the individual product descriptions found on the page. Use our convenient online design tool to customize the piece to your exact specifications. I have never purchased a product from the Amish Outlet Store and look forward to hearing from them regarding on an item I am interested in. Every item on the web pages are beautiful. In the past, I have purchased items from other Amish crafters in Ontario, Wisconsin. I loved every item purchased because they are truly artistic and I found that the Amish are very nice people to work with. Today, most products are no longer made with solid wood and purchasing a quality piece, made in the USA is very important to me.